Kyoto is famous for having been the ancient capital of Japan, dating back over 1200 years. The sheer beauty of the temples, shrines, gardens and culture imbued within its boundaries makes Kyoto one of the most revered places in the world. The property is 2 storied town house. 1 bedroom and 1 Tatami room are on the 2nd floor. Bathroom, washroom, washing machine(wash/dry),small kitchen is on the ground floor. Hair dryer and towels shampoo and body soap are provided. Shofu-an (means Pine Breeze) is one unit of Kyo Machiya Miyabi in Kiyomizu area, a big Kyoto traditional house, and was designed and renowed Kyoto based architect Geoffrey P. Moussas. Shofu-an is being meticulously preserved with the traditional techniques that have been handed down for centuries. While sticking to tradition is important for the architect, updating the facilities, such as modern bath-shower room, high-tech toilet, kitchen, heating floor, are just as important to meet the present day needs of our guests. The delicate balance between 'old and new' is what sets this apart. Shofu-an is at the foot of Kiyomizu Temple, which is been designated a World Culture Heritage, and is very convenient for visiting by walking distance many others famous temples, shrines, downtown, and Gion, the most famous Geisha district! Enjoy Kyoto and the distinctive features of local townhomes by staying in a real Machiya, feeling the natural way of living and the change of seasons which distinguishes Kyoto' s culture and its people. Kyoto, the cultural heart of Japan is waiting for you! If the number of people is different from the number you actually book with, the extra fee will be charged. Please feel free to ask us for any questions. In this Kyoto typical house we could see a glitter of traditional atmosphere on the roof, wooden pillars, sliding doors or small garden inside the house. The Kyoto townhouse is called Machiya and this house strongly stimulated us to restore for living. Machiya used to be townhouses or shops for the merchants in the 17th century. Not only temples and shrines, but machiya stay is an attractive experience for all who want to know more about Kyoto' life style and its culture. A 15 minutes walk will take you to the riverside of the Kamogawa. You can take a pleasent stroll along the river, or do shopping in the nearby Kawaramachi area, convenient during rainy days as the shopping streets are covered, like Nishiki food market street. A night life spot is Pontocho, a narrow lane with no cars, full of elegant restaurants, bars, and where you can have a glimpse of a Geisha or Maiko on the way or from an appointment. In the next street west side of Pontocho there is Kiyamachi, a very lively night zone where you can find many kinds of restaurants, bars, pubs and more... Enjoy Kyoto just walking from Shofu-an! 1 bathroom Toilet and bathroom are separated. A famous district, Gion is about 15 min walk. Beautiful scenery and many historical places. 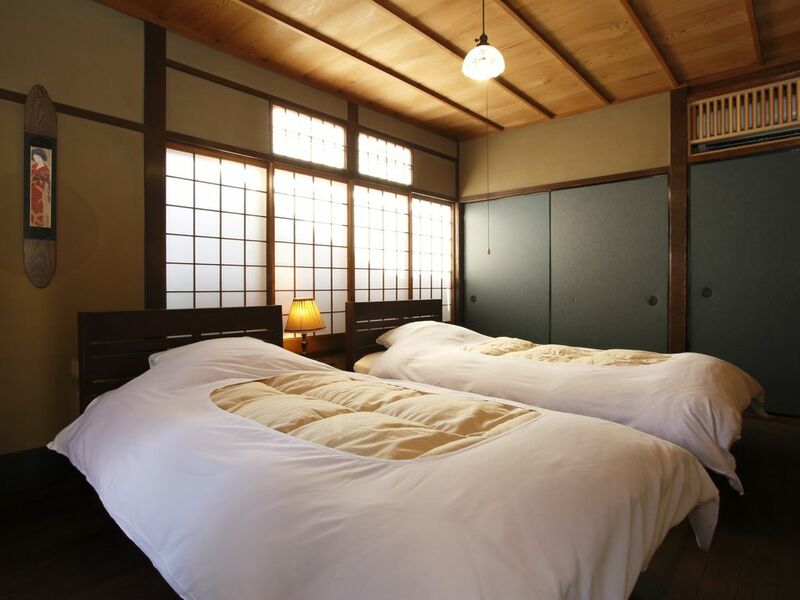 You may have a chance to see Geisha on Hanamikoji St.
Each bed room and living room have an air-conditioner. a bath with private garden, espresso coffee maker, floor heating system in the kitchen and bathroom area ※Previously, we had a sundeck on the 2F. But there is no sundeck now. The apartment is in a fabulous part of Kyoto. Great restaurants, shops & shrines are close by. The apartment was very historical but with all modern amenities. Communication was excellent and any questions we had were answered right away. The location is the best. We could walk to so many great restaurants and shops, yet where the apartment is located is a quiet residential street. Thank you for staying with us and good comments. We are so happy to hear that. I'm sorry for the light bulb of th bed room went out. Please enjoy travelling in Japan 2 more days. We are looking foward to seeing you again. Great location, easy check in and check out, mistly clean, really AUTHENTIC old Japanese traditional house. Nice size bedrooms, sufficient bathroom and shower facilities. The only problem for us was a complete absence of a living space to hang out in at night. There is a very small tatami area in between the kitchen table and the staircase to the bedrooms which is in front of the very small TV, but the area is too small to gather in. Additionally , it would be nice to have some other than just Japanese channels on TV. My husband was concerned with fire safety as we could see wiring near the ceiling. As expected there is practically no sound insulation so be prepared to hear everything that is going on outside and next door . A strange smell in the small area in between the front door and the door to the house where you take your shoes off. Walls and chairs in the kitchen need some freshening up as they appear somewhat worn, stained and scratched. We tried the authentic experience, but I don't think it was for us, unfortunately, which is not to say that it won't be a good fit for you. Thank you very much for your kind and detailed review, it is very much valued. We appreciate your comments regarding our customer service and ongoing upgrades. A friend and I stayed here for four nights while traveling around Japan. Communication before we arrived was timely and excellent, and Jackie was extremely helpful and nice when we checked in. She made sure we understood everything we needed to know about the property, the area, and things we might want to do and see. The location was very convenient for lots of restaurants, sights, transportation, and shopping. We loved the quirky layout of the property and the traditional touches like sliding doors and tatami floors in some rooms. The kitchen is small but suitable for everything we needed, and there's a grocery store nearby (less than 10-minute walk). Despite very cold outdoor temperatures (we were there in February), we were always toasty warm at the home between the great heaters and heated floors. We greatly appreciated that they provided everything we needed to do laundry and took advantage of it to do a load. The shower and bath were absolutely divine. We were able to arrange luggage delivery from our ryokan in Tokyo as long as we scheduled it to arrive when we were present at the property in Kyoto. When we were done with our stay in Kyoto, we were able to send out luggage on to Hiroshima while we visited Koyosan for two nights. There is a luggage drop off place less than a 5-minute walk from the property (Gion Shijo station, Global Yamamoto). Overall, everything was prefect and we were delighted with our stay. I would definitely recommend it to others, and I would be happy to stay there again. Arigatou gozaimasu!!!! Our second wonderful stay in one of these excellent holiday apartments in a beautifully renovated machiya - warm & comfortable even on the coldest night & kind helpful hosts. Thank you very much such a warm, kind review. We really appreciate your comments, and we are pleased that you found value and hospitality during your stay. Again,Thank you very much for your lovely review. We look forward to seeing you on your next trip to Kyoto again! Shofu-an provided a perfect launching point for our very brief visit to Kyoto. Our group of 3 adults and 2 children fit perfectly in the Shofu-an. We were warmly welcomed upon our arrival and enjoyed the experience of sleeping in a real Japanese home complete with tatami mats, heated floors and futon bedding. The location is perfect for launching out for sight seeing during the day and exploring dining options at night. I hope to stay here again next time I get to visit Kyoto. we really appreciate your comments about our house, and we are pleased that you found value and atmosphere of Japan during your stay. We look forward to seeing you on your next trip to Kyoto again. Surrounded by many great things to do and see. We were also picked up and dropped off from Kyoto station which helped a great deal. Many suggestions helped us pick great things to do and see. There are nearly 808 temples and shirines in this small town!